Located in Tranquility Estates, this brand-new cabin is truly in a tranquil setting. Sit in the hot tub and watch the sunset over the beautiful mountain view. The firefly show is amazing. There is 2500 square feet of living space that can easily sleep between 8-12 people. The cabin is decorated in a "cottage-camp" type of setting. The top floor has a private master bedroom with a king size hickory log bed with Nautica bedding and a private master bath. Also, on the top floor, there is a loft area with a queen sofa sleeper, flat screen TV, stereo and table for playing games, etc. The main floor bedroom has an iron queen size bed with Ralph Lauren linens. 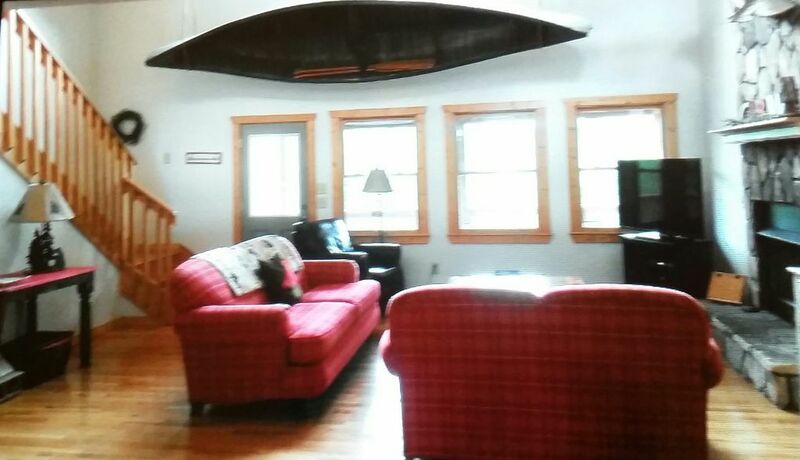 The main floor also has a fully equipped kitchen with stainless steel appliances, a full size washer and dryer, a full bathroom, dining area and island bar, and a living area with plenty of seating, fifty inch screen TV and DVD, and a gas fireplace for those chilly evenings and mornings. The basement has another full bathroom, another bedroom, a set of bunk beds and a queen size sleeper sofa. The basement also has a game room with darts, a ping pong table, TV with DVD/VCR, games, and a foosball table. Step out onto the deck and sit in the large hot tub and enjoy the mountain air. Walk down to the creek and enjoy the cool rippling water. My husband and I purchased this property seven years ago due to really enjoying the Murphy area with the Blue Ridge mountains and Smokey Mountain area nearby. We try to visit as much as possible. We love the location of the cabin. We looked for 3 years before deciding this was the perfect place! The cabin has a perfect porch view of the mountains, rippling creek, and is very quiet and private. It's a nice cabin with all the basics you could need. Even comes preloaded with some games in the downstairs closet (classics like Clue and others). It's "out there" without being too far out, you're within close proximity to drive to Mineral Bluff for supplies at the Dollar General or Blue Ridge if you want more shopping options, just to walk around downtown, or catch a double feature at the Swan Drive In. The cabin itself is roomy, giving enough room to not feel like you're on top of each other with a nice wrap around porch that includes some awesome views of mountains and a creek just below. There's a good table for playing games and a grill on the porch for cooking (along with the standard things in the kitchen like a coffee maker, kettle, etc...). Couches are comfy for sitting around and watching TV and there are other fun things like the hot tub, foosball table, and a ping pong table. Would definitely stay here again if we're looking for a place in the area. We love this place and WILL be back! We found this place while looking for a cabin retreat and we were so blessed! Very close to anything you would want to go do, but still is secluded and private at the cabin. There was plenty of room for our 3 families we had. Even though it was raining nearly the entire time we enjoyed hiding away from the world, playing games, relaxing in the hot tub, and just being with family. Thank you so very much for that nice review! Enjoyed having you as guests. Thank you for sharing your beautiful cabin with our family. There was plenty of room for all 8 of us and our fur-baby. We had a gorgeous view from our back decks and even saw several deer on 3 different days. Although we did read reviews about internet speed, it seemed to affect Netflix/Roku stations. We couldn't even get the main floor and 2nd floor televisions/dvd player to play regular dvds that we inserted. It may have been an issue with connection or cables, I don't know. The basement TV did fine with DVDs but that's not where we were wanting to gather. However, we did enjoy a few of the abundant selection of games available and enjoyed our family time, making memories. Anywho, except for that and stink bugs/ladybugs (harmless) around, it would have been an exceptional stay. By the way, your neighbor is very nice and made us feel very welcome. Thanks for your comments. Sorry about the dvd players. I have not been told of any issues with them until now. Yes, sometimes the internet is slow but that is the only option right now that we have for internet due to being in the mountains in a rural area. This location is located in between two rivers with river rafting, antique shopping, hiking, gem mines, new casino, horseback riding, tubing, and many more activities. There is a price increase increase for a 1 night stay. The price for 1 night stay is $140 $25.00 pet fee for first pet, $10.00 each additional pet. Subject to owner's discretion. Occupancy over 12 person's will be an additional $10.00 charge per person per night.